Blasting involves extreme forces capable of causing catastrophic personal injuries and death, as well as overwhelming damage to your home and property. If you have suffered devastation as a result of a blasting accident, contact Angotti & Straface Attorneys at Law L.C. in Morgantown, WV, immediately. Our law firm has over 66 years of combined experience securing justice for our clients and a remarkable track record of successful litigation against at fault parties. We offer the expert legal representation required to prepare a winning case for you. Has blasting for coal mining excavation or fracking in the mountains of West Virginia resulted in serious damage to your home, property, or health? 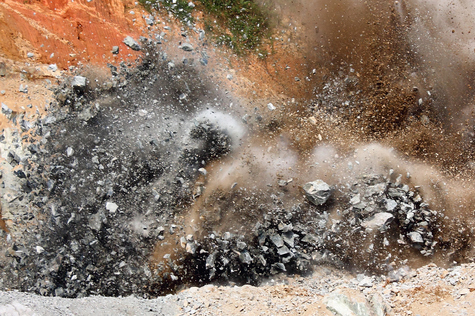 The detonation of explosives used in blasting projects produces powerful shock waves that are capable of obliterating rocks, as well as anything withing the blast radius, including your property and body. In addition, any gas present may become highly pressurized. The energy from the blast is capable of maintaining its destructive energy as it travels outward from the site of detonation. Despite the strict government regulations, monitoring, and reporting requirements, damages frequently occur due to the inherent nature of the blasting process. Homes and businesses located near blasting zones may experience damage from flying debris and structural collapse, while those located at some distance may suffer damages including cracked plaster or drywall, crumbling mortar and masonry, foundation damage, ceiling collapse, water leaks, and popped nails. Carbon monoxide leaks may also occur as utility lines and fixtures are damaged. What Should I Do If My Home Has Been Damaged by Blasting? If you believe that your home or business has been damaged as a result of blasting, you should record the damage, contact your property insurance carrier and the blasting contractor to briefly inform them of the incident, and take any immediate, temporary steps necessary to protect your property from experiencing further damage or losses. If the damage was caused by flying rocks or debris, please notify the West Virginia Fire Marshall’s Office at: (304) 558-2191, extension #219. As soon as you have notified all relevant parties, contact Angotti & Straface Attorneys at Law at: (304) 292-4381. We offer a complimentary initial consultation to discuss your claim. We provide prompt answers to your most pressing legal questions and stand by your side throughout the entire process until you are fully compensated for your losses.